The guiding principle of the selected design “Village in a House” considered the privacy needs of each individual, but reduced private space to a minimum in order to place a focus on common activities. The guiding principle of the selected design “Village in a House” considered the privacy needs of each individual, but reduced private space to a minimum in order to place a focus on common activities. There should be space to exchange opinions, to share cultural life and to make the community a lived reality. The selected project title, CUBITY, is made up of a combination of the words cube, city and unit, and is emblematic for this idea. The area of the exterior volume is sixteen by sixteen meters; a translucent façade made of polycarbonate panels encloses the space. The four façades are all treated identically. Transparent glass highlights the corners and makes the exterior visible from the inside. On the inside, the spatial organization and the zoning have been set out without a specific orientation, so that CUBITY can react flexibly and be adapted to the respective site. Twelve living cubes have been placed inside the large volume which are not attached to the façade. The cubes are stacked pairwise and each has a base area of 9.5 square meters. Each cube is outfitted with a prefabricated sanitary module and built-in furniture. In this manner, optimized private cubicles could be created for a total of twelve people. Their spatial arrangement is oriented on the façade, forming a square—the so-called market square—in the center. The market square serves as a freely adaptable space, a central meeting point and opens up various possibilities for activities. Semi-private intermediate zones are located in the space between the façade and the private living cubes, and smaller common spaces are located for example in the kitchen, in a lounge in the upper floor and its adjoining terrace. The upper living cubes are connected to the market square by single-flight staircases. Just like on the ground floor, the entrances to the living cubes, which are located along a gallery on the second floor, are oriented towards the façade, so that a semi-private intermediate zone shielded from the market square is created here as well. In addition, a semi-private lounge is located in the corner of the gallery. Viewed from an energy perspective, the 256 square meter net area of the hall also stands in contrast to the living cubes. In the cubes, each resident can adjust the temperature themselves individually in contrast, the hall, a weather-proof exterior space, can only be heated or cooled in certain areas. 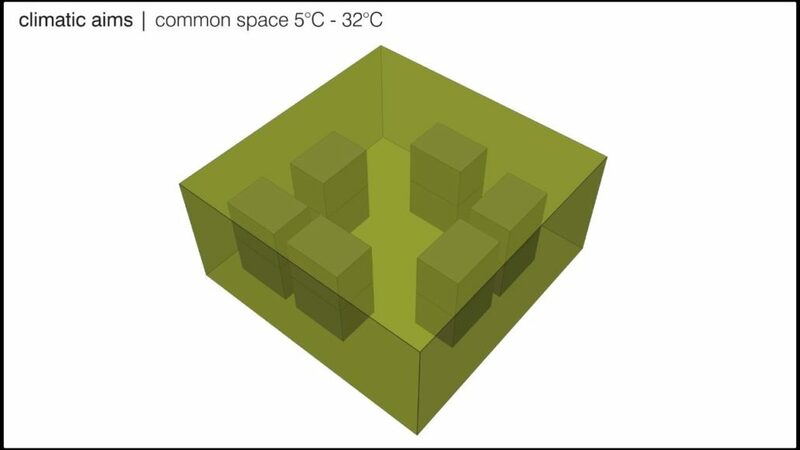 The interplay between the heated and spatially optimized living cubes and the generous, but not consistently heated or cooled common areas, reflects the sufficiency idea behind the concept. The CUBITY concept strives for an optimization of the private spaces and a maximization of the common space. The large common space, made up of a market square, kitchen area, gallery and terrace, can be freely used and adapted by the residents, thereby satisfying a variety of different day-to-day situations in the lives of the students. The barrier-free entryway is so generously proportioned that it can be used as a common terrace. Across the room and through the market square, one comes to the commonly-used kitchen, which also opens out onto a private terrace. The market square, located in the middle of the building, represents the predominant common space which can be used by all of the residents yearround. Centrally located with a direct connection to the kitchen, the market square is open on all sides. A floor heating and cooling system ensures the market square’s seasonally-determined temperature regulation, which is generally conceived as an intermediate climate. 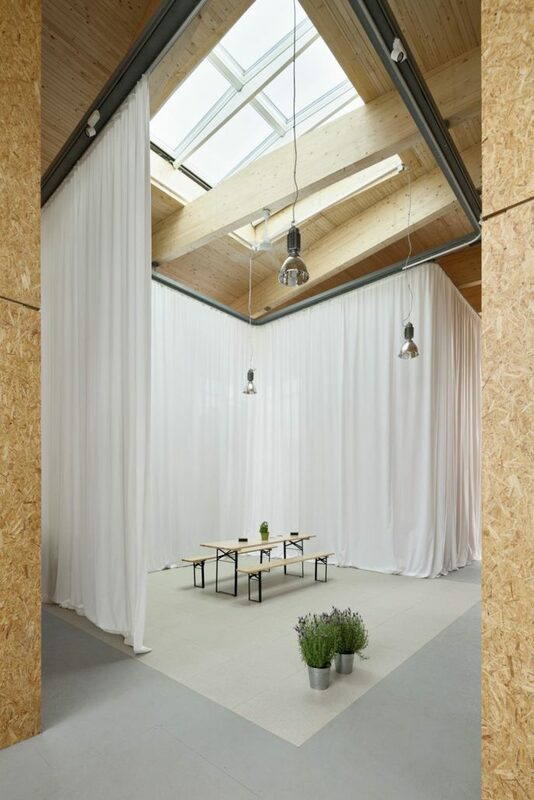 A floor-to-ceiling curtain takes on central importance in winter, when it can be used to temporarily shield the market square as the “center of the community” and offer higher thermal comfort. In addition, the curtain serves as a playful element with which the space can be spontaneously changed. The upper floor is reached via several sets of stairs, which end in a gallery. The gallery serves as an access to the upper living cubes and is also so largely proportioned over the kitchen that there is a lounge area located there. The students also use this common space to spend time with each other or alone. One of the most important guiding principles in the design of the individual living cubes was the principle of minimal, i.e. spatially optimized, housing. The living cubes are there for private withdrawal, sleeping, working, storing personal belongings and hygiene. 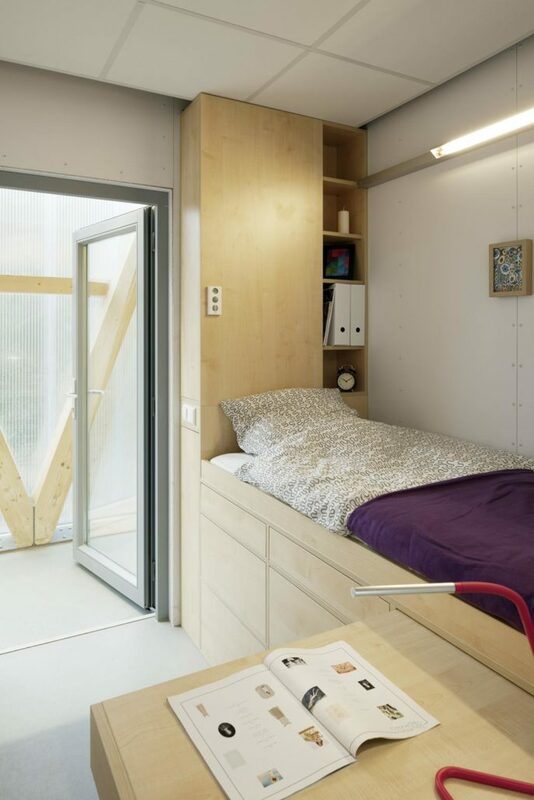 In the room, which has an area of only 7.13 square meters net, a specially developed, spatially and functionally optimized piece of built-in furniture, comprising the bed, wardrobe, chair, table, light, electrical sockets and storage space, makes a versatile use of the small space possible. 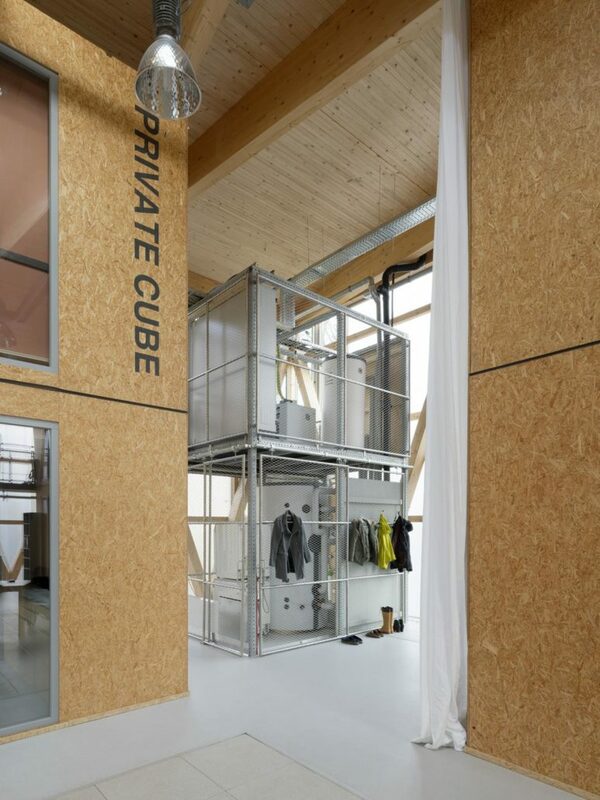 The living cube is supplemented by a minimal sanitary module with a toilet, shower and sink. A floorto- ceiling window element with narrow opening casements oriented towards the market square helps to establish a visual connection and contact between the private living space and the common space. An integrated privacy screen, which can offer either shading or complete light blocking, helps ensure privacy in the cube. In total, living cubes for twelve students are available; six on the ground floor and six stacked on top of these on the upper floor. There is one staircase for every two cubes on the upper floor. The entrance doors of all the cubes are oriented towards the façade and are located in a semi-private intermediate zone. The doors are made of glass, thus enabling the illumination of the private space through the semitransparent façade. 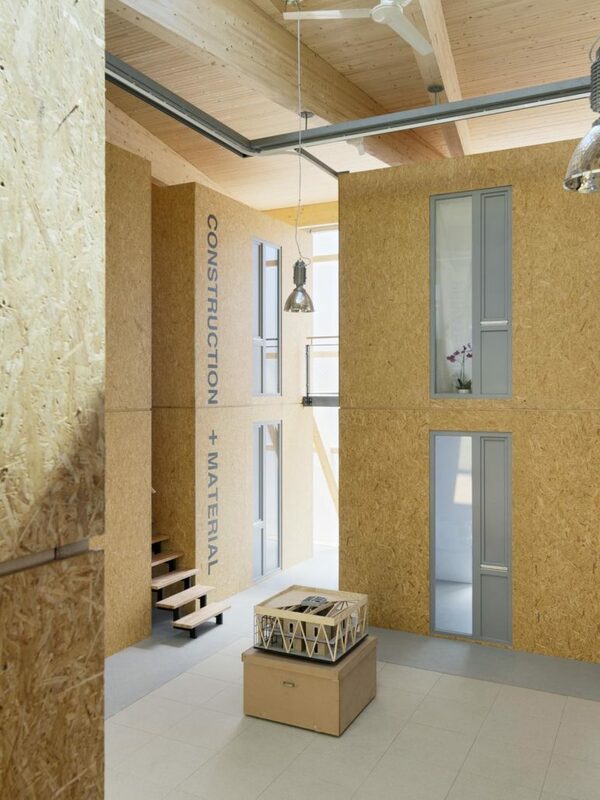 The walls of the individual cubes are a timber-frame construction with an internal insulation layer and clad with OSB panels. The living cubes are accessed on the side not facing the common area, which creates an intermediate zone in front of each of the private areas between the living space and the façade. This is, however, much more than just a hallway. This space is used as a semi-private area by the respective residents. As a private entry area, it forms an extension to the minimal space available and is appropriated by the students. This appropriation takes place to varying degrees: it ranges from a simple use as a private lounge in front of the respective living cube to an extension of the student’s storage space, i.e. as an additional space for their wardrobe, bookcases or other things. In order to work out the ambivalent character of the hall space between the interior and the exterior, it was important to reflect this introversion in the design of the façade as well. 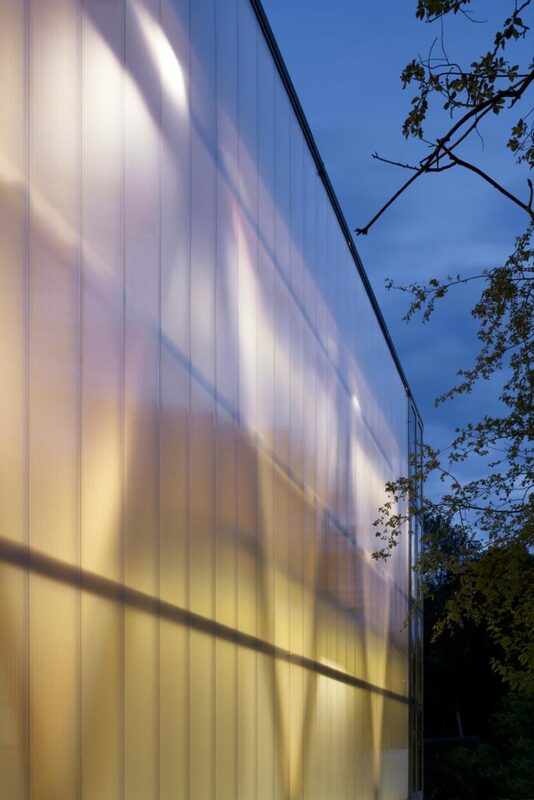 The translucent building envelope is thus an expression of the community. In addition, as a result of the unconditioned interior space, it was necessary to optimize the solar gains and to limit transmission heat losses through the building envelope economically, in order to make the envisioned PlusEnergy standard possible. Therefore, the roof and floor were built as highly insulated structures. Through the arrangement of the support structure behind the outer skin of the building, the façade was conceived as a classic curtain wall and freed from all structural functions. The desire to lend the building lightness could be realized through translucent polycarbonate panels, with multiple air chambers. The façades are covered with vertical, fiftycentimeter wide, frameless polycarbonate elements, which span the height of the building. Through their homogenous surface on all sides, a level of illumination in the interior similar to outside conditions can be achieved. The truss diagonals and private living cubes are vaguely visible from the outside. At the same time, this envelope assembly made it possible to achieve the desired building physics parameters, namely an overall energy transmittance (g value) of 0.41 W/m2K and a thermal transmittance value (U value) of 0.71 W/m2K. Dynamic simulations of the thermal behavior and air flow in the building and through the openings were performed. The aim of these was to avoid overheating in summer through the completely translucent façade and to gain points of reference for the type, size and arrangement of the openings in the façade, so as to implement the natural ventilation concept. Based on these simulations, a system of transparent glass corner window assemblies, was developed. These can be opened across the entire height of the building. Together with the skylight in the middle of the building, they ensure ventilation through natural thermal principles during peak summer temperature. In addition, they provide accentuated visual axes between the exterior and interior. The development of a holistic energy concept and its technical implementation are closely connected to the architectural and social aspects of the project. 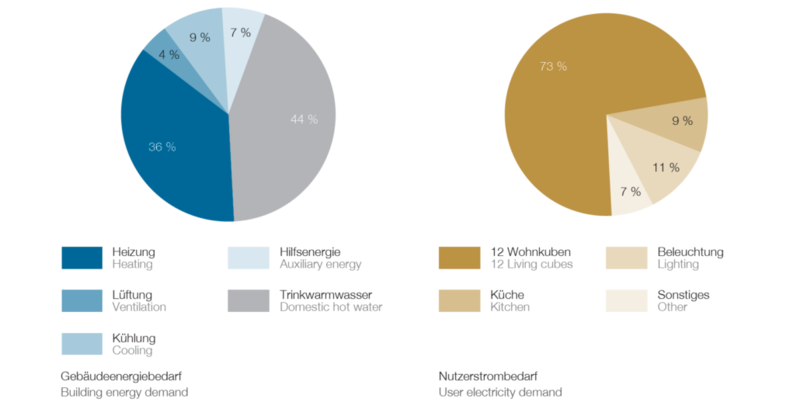 Spatial demand (square meterage), and energy demand (kilowatt hours), were considered in terms of sufficiency. The guiding question here was: what do we really need? On a technical level, this means first questioning the comfort demands which are described in norms, and then developing these further in a differentiated way without losing sight of comfort conditions. The residual need should be met through regenerative energy. 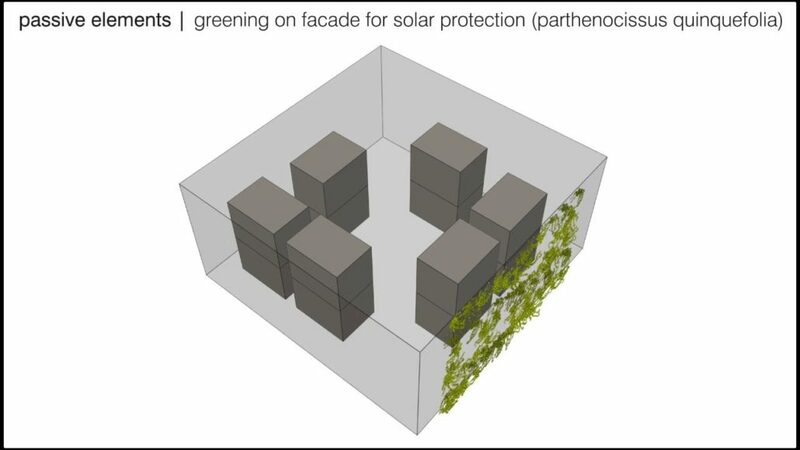 Analogous to the sufficiency approach, the highest thermal comfort quality was specified only for the minimized individual areas of the living cubes, while for parts of the main hall, for winter conditions, the focus was merely placed on frost protection and/or avoiding condensation on the inside of the façade. Differentiated target temperatures were defined for the kitchen, market square, entryway and living cubes. Thereby, the temperature level in the central common area (market square) can be temporarily and significantly influenced by means of spacedefining, floor-to-ceiling curtains. A natural ventilation concept was developed for the main hall. The windows on the corners of the building and the central skylight are automatically opened and closed, depending on the indoor air temperature and the CO2 concentration. Sufficiently large openings allow for effective ventilation to prevent overheating during the summer months. The dimensions and location of the openings were determined through the flow simulation of the building. Thermal lift is used to ensure a sufficient volume flow from the corner windows to the skylight. A central building control system operates the opening casements, automatically implementing pre-defined ventilation scenarios. Wind and rain sensors prevent unfavorable conditions in the building’s interior. 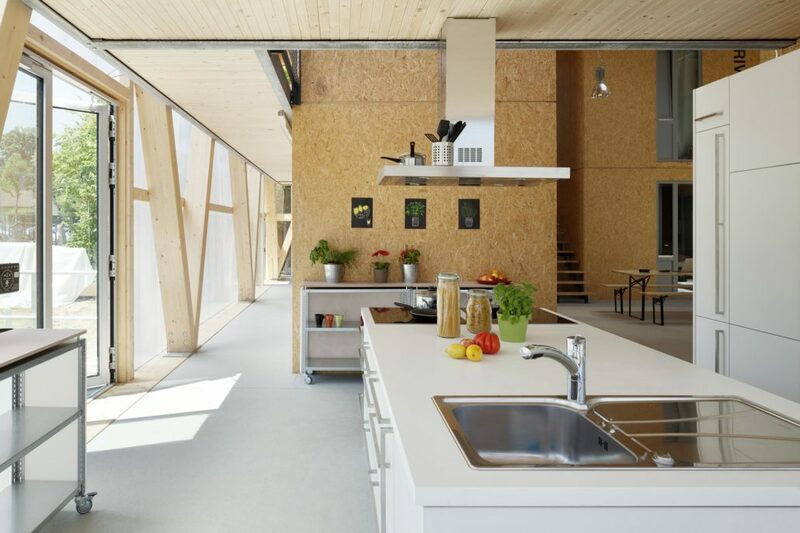 The house-in-a-house principle also allows for natural ventilation in the living cubes; windows and doors can be individually adjusted by their users. When the openings towards the common area are closed, a mechanical ventilation system ensures sufficient air quality. Fresh air from the exterior is drawn in directly through controlled openings in the façade layer and flows through the small, individual living spaces. Moisture sensors control speed-regulated exhaust fans in the bathrooms, which then generate the necessary negative pressure and required air exchange. If conditioning of the exterior fresh air is necessary in summer or winter, an integrated ceiling panel can either provide heating or cooling. 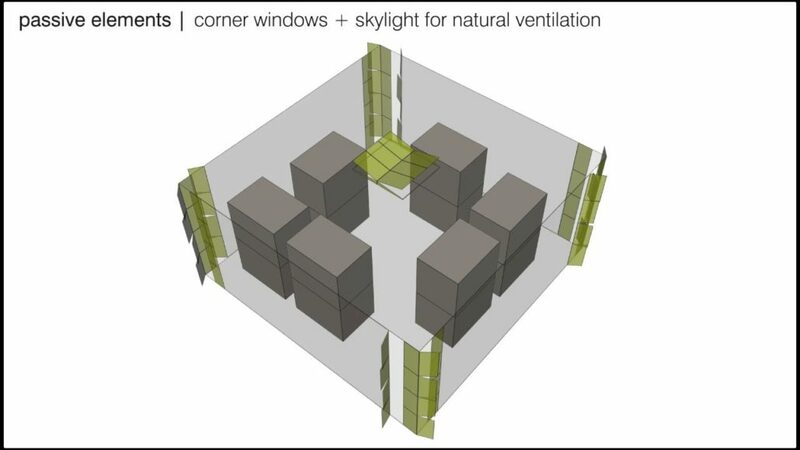 In the living cubes, the air flows through a drywall reveal across from the air intake. An undercut in the sliding bathroom doors allows airflow into the bathrooms. The exhaust air from two stacked cube units is combined and expelled over the roof. Differing comfort levels have been approved for spatial conditioning in CUBITY. 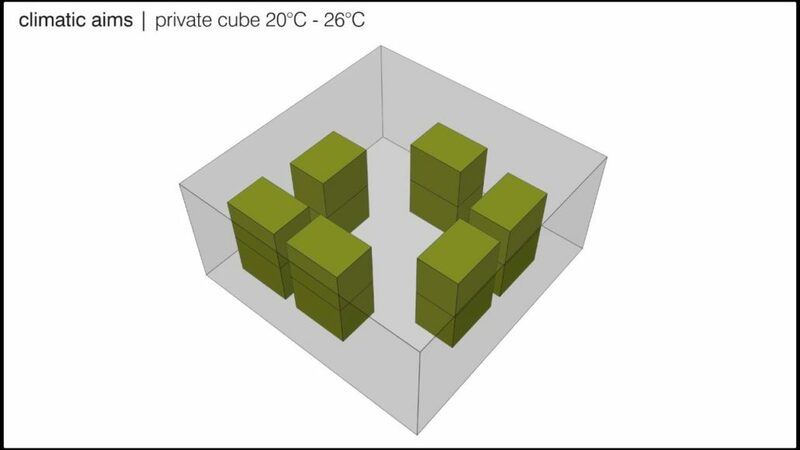 The individual adjustment of room temperatures within the conventional norm range is only possible in the living cubes. The kitchen and the central area are also conventionally heated and, in the summer, cooled through the activation of thermal mass. 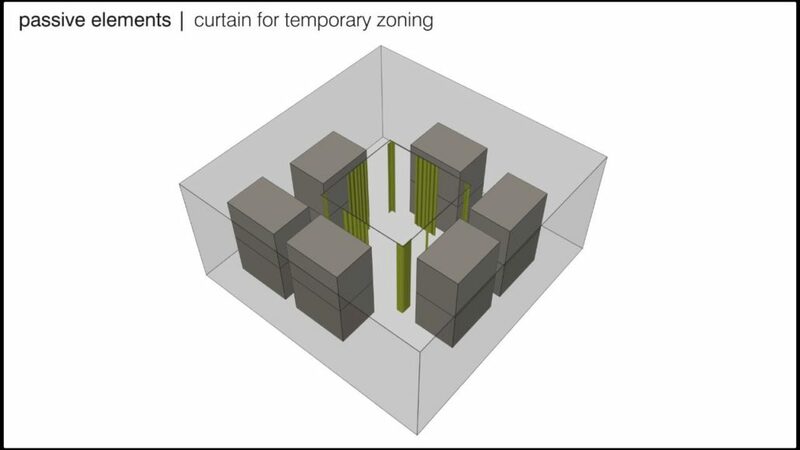 The zone between the living cubes and the outer façade has the widest range of possible room temperatures. The central common space, the kitchen, and the entryway are heated and cooled through floor-integrated surface systems. The floor provides the largest amount of thermal mass in the building. When the regenerative electricity yield is high enough to power the heat pump through self-produced electricity, the thermal masses can be heated or cooled with a reversible air-to-water heat pump. The thermal mass provides a time-delayed delivery. Inside the living cubes, space conditioning is provided by a radiant ceiling heating and cooling system. During the winter months, the central ceiling fan in the main hall can be used to push the warm air back down towards the floor. In addition, the spatial delineation of the common space through floor-to-ceiling curtains can create zones with very high comfort levels. The supply of domestic hot water is organized in two steps. 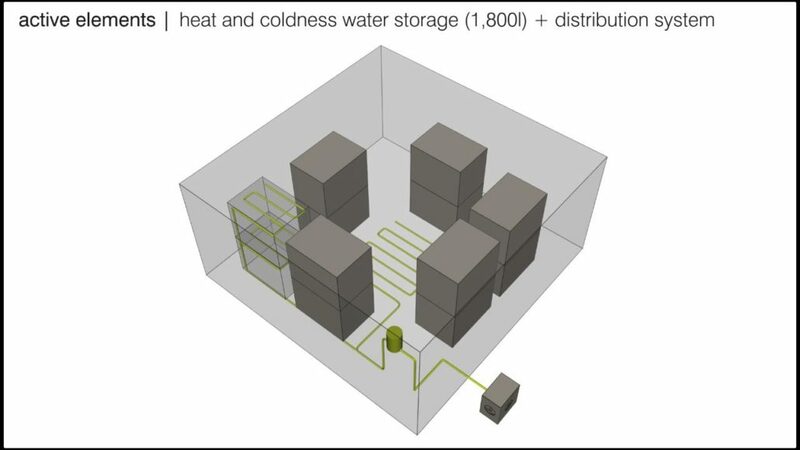 A separate heating cycle pre-heats the cold water using plate heat exchangers near the living cubes. The individual hot water temperature is obtained through electric continuous-flow heaters in each living unit; distribution losses are avoided and the energy-demand from the heat pump is reduced because it only has to supply water at a low-temperature heating level. Electricity is the only energy source in CUBITY. The building-integrated photovoltaic modules on the roof annually produce about the amount of energy necessary to cover building operation and user demands. Through the avoidance of local emissions, a nearly climate-neutral building status could be achieved. The design according to the PlusEnergy standard also requires the consistent reduction of electricity demands through the use of energy- efficient appliances. The roof area is equipped with seventy-eight polycrystalline photovoltaic modules offering a nominal output of 19.89 kWp. The regenerative yield is primarily used in the building for temperature control and domestic use. Only surpluses are fed into the public power grid. Load management, which synchronizes energy use and gen- eration as much as possible, ensures a maximum use of self-produced electricity. In addition, thermal storage systems can store converted solar energy, in order to further increase the portion of energy demand covered by solar. 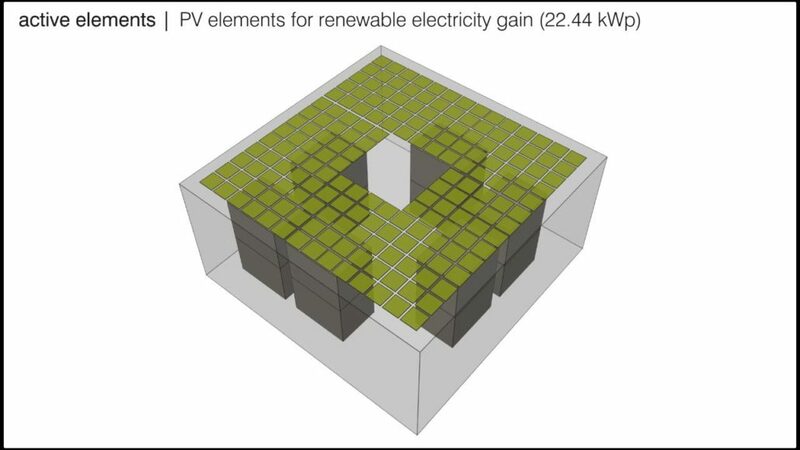 Conceptually, the annual yield from photovoltaic electricity should achieve a regenerative output which covers the electricity needed to run the building, including the power needs of the users. With a performance of 19.89 kWp, about 21,200 kWh are generated on the roof of the building annually. The photovoltaic modules, which have been installed in an east-west orientation, feed the electricity that they produce directly into the building’s internal grid. All of the building systems, including the heat pump, the electric domestic hot water supply, and the demand-based mechanical ventilation systems, are designed and laid-out for direct consumption. When both the demand and production of electricity occur simultaneously, these systems are supplied with renewable energy which is generated on-site. Sixty-five percent of the building’s total electricity demand supplies the building, of which fortyfour percent goes towards the hot water supply. 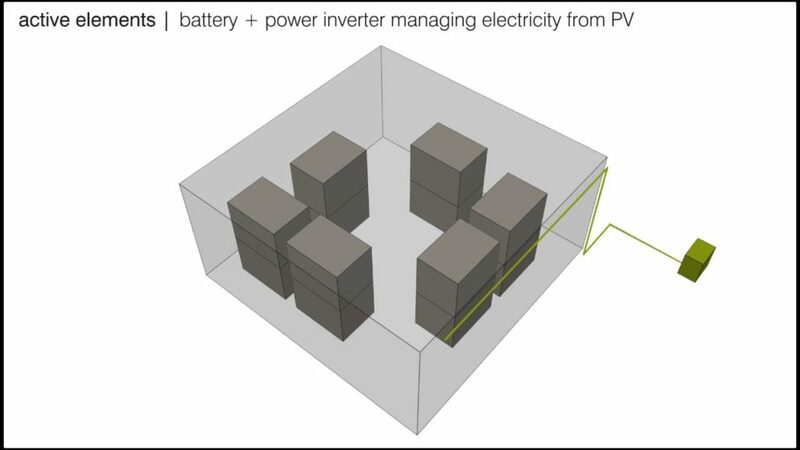 In addition, the photovoltaic electricity can be used to cover user and equipment needs, for example in the kitchen and the living cubes; these uses make up for about thirty-five percent of the total energy consumption. An estimate for shared electricity, including basic and exterior lighting, is additionally considered in the balance. In order to meet the PlusEnergy standard, the energy produced needs to exceed the demands for both final and primary energy. In the annual balance, the regenerative surplus exceeded the final energy demand by 1.5 percent and the primary energy demand by nearly eighteen percent. Thus, the defined PlusEnergy standard requirements could be fulfilled. In architecture, light is primarily planned based on functional aspects; its atmospheric effects are usually not taken into serious account. In contrast, CUBITY’s lighting concept aimed at integrating qualitative and perceptive criteria in order to achieve a good balance of natural and artificial light for both energy efficiency and the users’ comfort. An interior bathed in daylight was part of the concept for the student community from the beginning. Through the use of various elements in the building envelope, it was possible to achieve a very high degree of natural light in the interior and a high quality of daylight incidence in the communaly used hall, the surrounding common zones and the living cubes. The translucent polycarbonate façade on all four sides of the building creates an evenlydistributed daylight incidence while still protecting the students’ privacy from the outside. Transparent, floor-toceiling corner window elements are located at the façade’s corners, which provide not only natural ventilation, but also generous views of the outside thus strengthening the architectural-spatial impact of the interior. 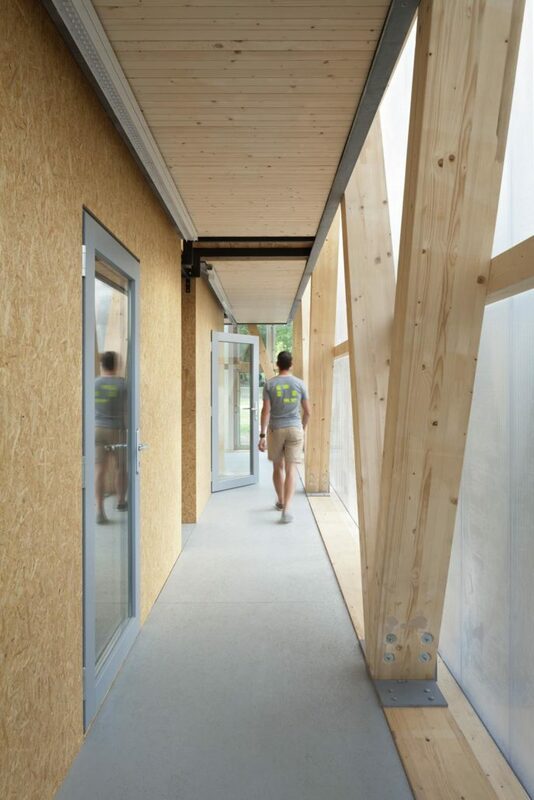 In the center of the building, the daylight supply is ensured through the positioning of a prefabricated, fourby- four-meter modular skylight system in the roof, which floods the interior common space of the dormitory with daylight and offers a direct view of the sky. The natural illumination of the living cubes is made possible by floor-to-ceiling windows in each cube which are oriented towards the market square, in combination with a glass element in each door, which is oriented towards the translucent façade. High levels of daylight incidence have been proven to increase people’s well- being, creativity, commitment and attention span, but are also important for energy efficiency, in order to achieve the striven for PlusEnergy standard. The reduced need for artificial light decreases the building’s energy consumption. 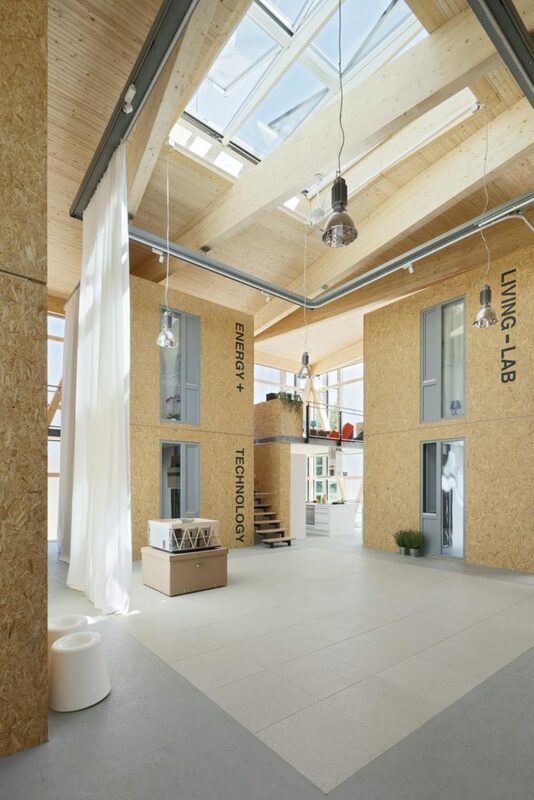 Together with VELUX, daylight simulations were developed in order to evaluate the daylight supply in the building from the beginning of the design process onwards. As one can see from the results of the simulations, the daylight quotient in the center of the building increases corresponding to the light incidence from the modular skylight system. Seen from outside, the lighting concept portrays two scenarios, one during the day and one at night. During the day, the translucent skin of the building appears sculptural and does not make the immediate visual communication between the interior and exterior possible; at night, this situation is reversed and the interior becomes perceptible from the outside. The artificial lighting concept, which was developed together with the project partner Zumtobel, supports CUBITY’s additive design principle, which is based on the layering of the individual elements from the exterior façade to the interior living cubes. The lighting focus is on the market square in the center of the building, for which a “light island” made up of natural and artificial light was conceived. A direct light made up of pendant lamps hanging from the roof construction sets the central common area in scene. The living cubes are lighted externally through a linear lighting system on the beam side facing the façade, in order to highlight their sculptural quality and materiality. The interior of the living cubes is lighted indirectly through a wall lamp above the suspended heating and cooling ceiling. In addition, a flexible lamp set in the built-in furniture serves as a reading and work lamp. CUBITY’s diagonal support structure is barely visible during the day, which is in line with the desired overall impression of a cube. The evening effect, however, aims to highlight the construction and the horizontal layering. The symmetrical placement of punctual light sources in the form of spots on the top of the columns enables the visual perception of the building’s structure and the dynamic movement and use sequences in the building’s interior at night, in contrast to during the day. An interesting and lively play of colors develops on the surface of the façade in interplay with the interior. The sufficiency topic was also considered in the choice of construction; for this reason, CUBITY’s support structure has been deliberately left visible and optimized with regard to the amount of wood materials. In this way, the construction concept focuses on “renewable resources.” A demountable framework construction made of laminated timber and divided into sections stands on the square footprint. The six-meter-high timber-framed outer walls are made up of supports arranged in V shapes, which are flexibly attached to each other on the connecting points with gusset plates, and linked to each other circumferentially. 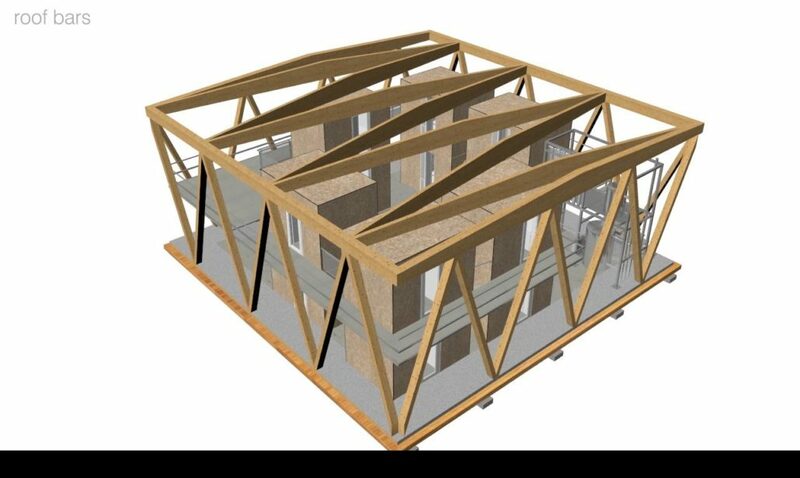 The square floor plan makes it possible to lay the roof support structure on the four timber-framed walls with diagonal supports and even to lay the roof trusses, which are made of laminated timber, as diagonal braces. Additional bracing for the horizontal reinforcement of the construction was therefore not necessary and the supporting structure could be made exclusively out of wood. 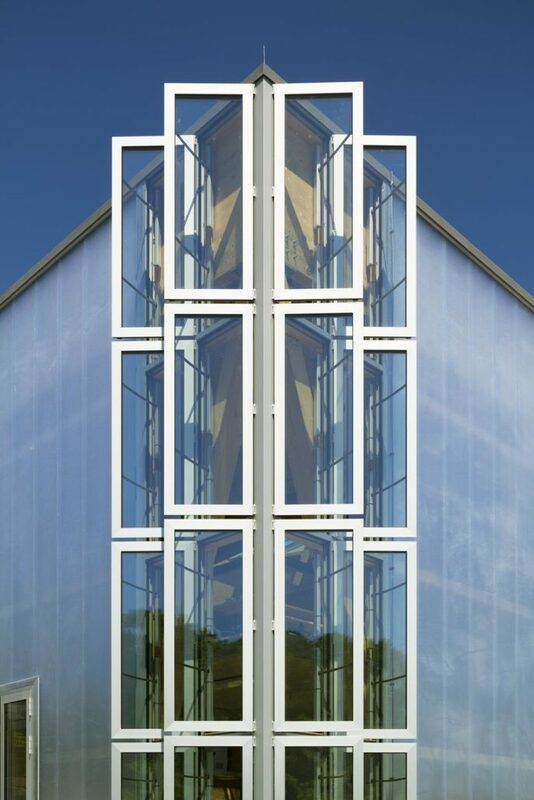 Timber-framed façade strips running horizontally in front of the walls serve as a mounting point for both the polycarbonate façade and the transparent corner glass constructions and transfers the force of the wind to the primary construction. In this way, uniform support conditions could be created for the horizontal mounting of the polycarbonate façade the whole way around the building. 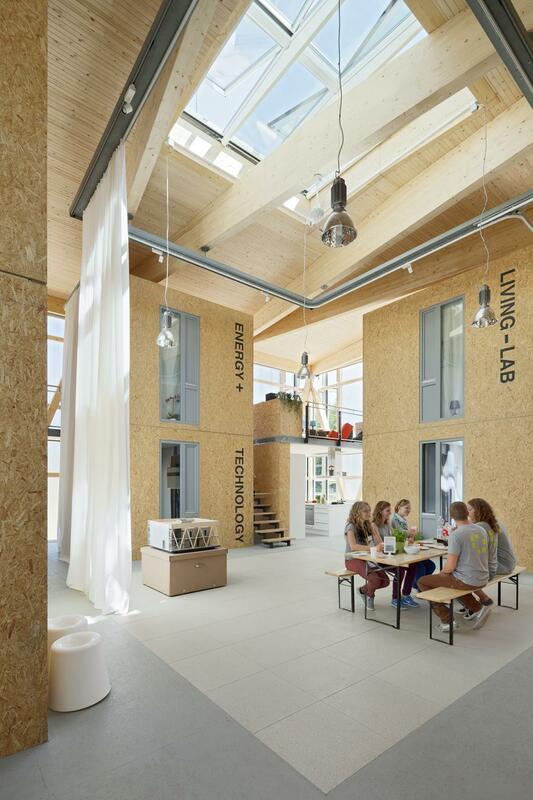 The individual laminated timber roof trusses bear the laminated timber ceiling with its central skylight opening. 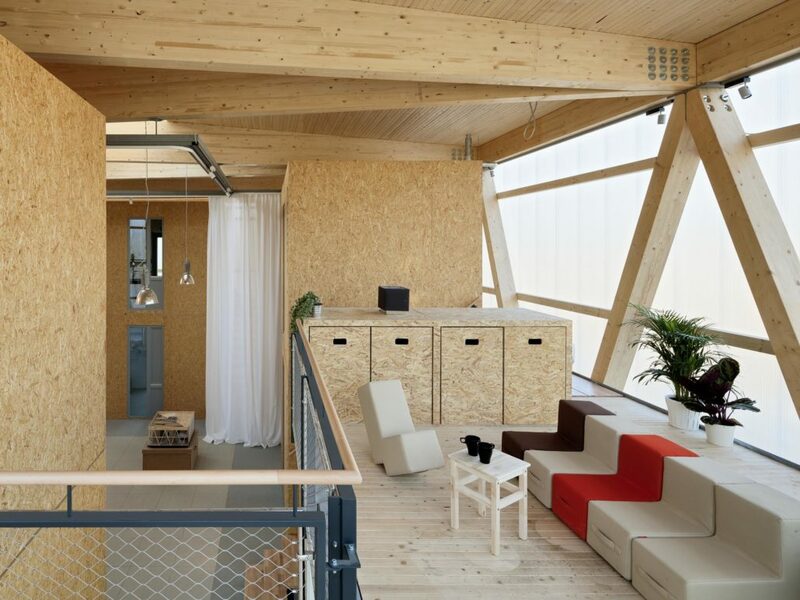 The edge of the roof is made up of slender attic trusses, which are also made of laminated timber. 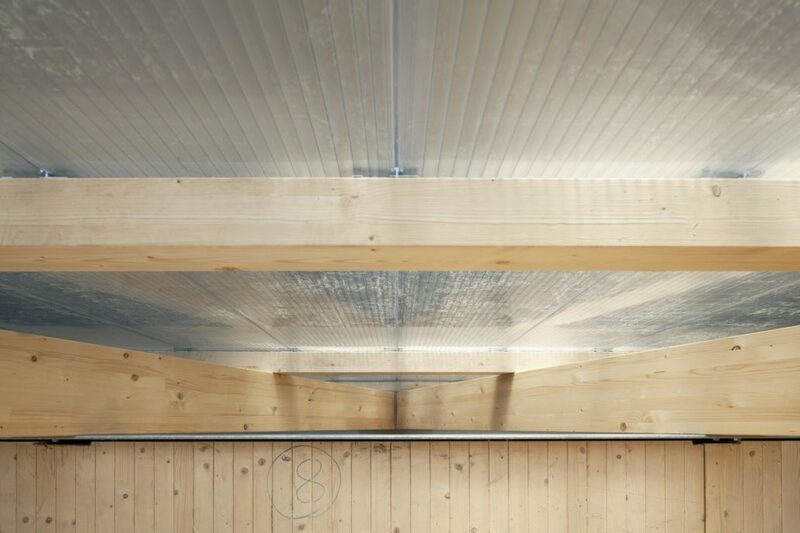 The upper interior surface of the building is made up of a laminated timber ceiling with an externally insulated roof system. The roof also provides an area for the photovoltaic installations. The lower interior surface is made up of laminated wood floor panels supported by laminated timber beams. 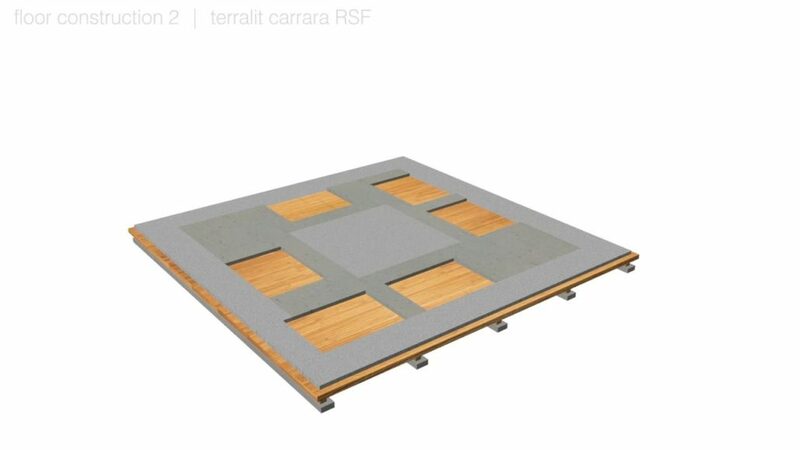 The floor panels are outfitted with mineral insulation underneath. Along the façades and in the market square in the center of the building, concrete stones, which are able to store warmth, were used. The two-story living cubes located in the main hall are constructed of prefabricated studs and laminated timber elements. 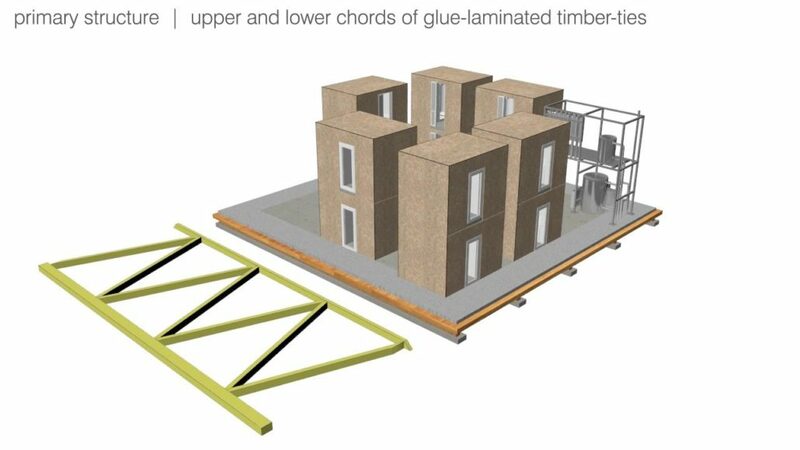 The loads generated are transferred through the panel made of laminated timber elements to the load-distributing beams, to the screw-in foundation and finally into the ground. A gallery runs circumferentially around the cubes along the inside of the façade, which acts as a connecting element between the cubes and is also the access point to the cubes. The gallery is also made of laminated timber elements, which are laid on steel profiles. The steel profiles are connected to the hall supports and the living cubes. The horizontal loads caused by wind are absorbed in the roof by the attic trusses and the main roof trusses. Together, these act as a horizontal framework, which conducts the loads to the outer walls. 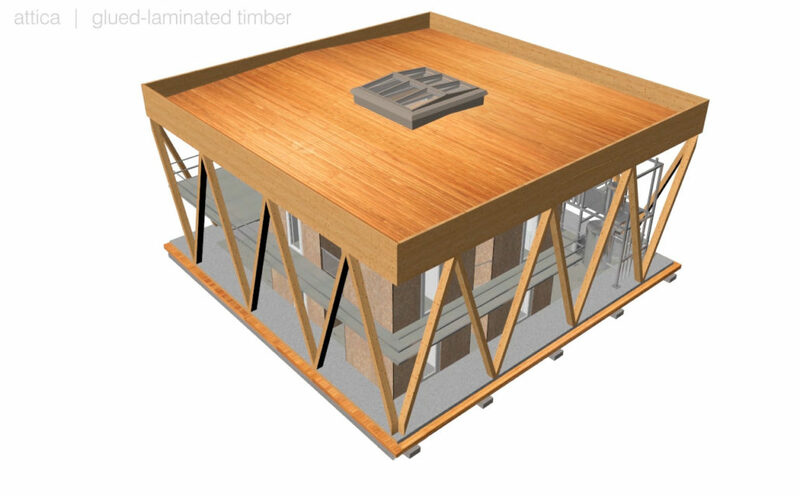 In addition, the laminated timber panel reinforces the roof. The construction of CUBITY took place between June 11 and June 26, 2014. The assembly was carried out by the project partner DFH (Deutsche Fertighaus Holding), who involved the student team for parts of the construction under the supervision of the construction management. The students were responsible for all of the interior fittings (furniture and floor coverings, market square curtain), the installation of the exhibition media and the overall coordination of the construction management, including the acceptance modalities with the event organizer CSTB Solar. The completion date stipulated by the event organizers was met. The assembly process in Versailles was recorded by the students using a Steadicam. 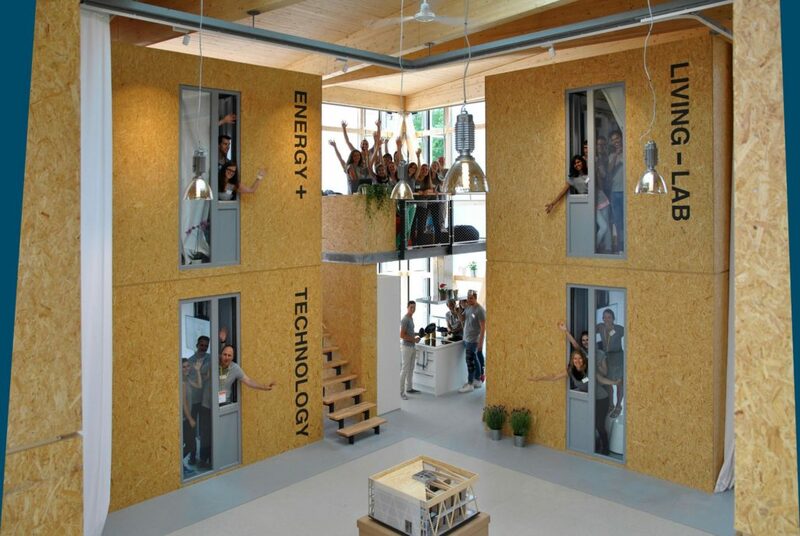 The Solar Decathlon Europe at Versailles was ceremonially opened on June 27, 2014. In total, twenty-five teams from Italy, Spain, France, Germany, Switzerland, Denmark, the Netherlands, Mexico, Taiwan, Romania, India, Thailand, Japan, Costa Rica and the USA presented buildings. Of these, twenty teams participated in the competition. The ten disciplines of the competition took place between June 27th and July 14th. The following teams were awarded the first three prizes: 1st prize: Rhome for denCity / Rhome (Rome, IT) 2nd prize: Philéas / Atlantic Challenge (Nantes, FR) 3rd prize: A Home with a Skin / Prêt-à-loger (Delft, NL) During this time, CUBITY was presented to the international public as an exhibition and demonstration project. 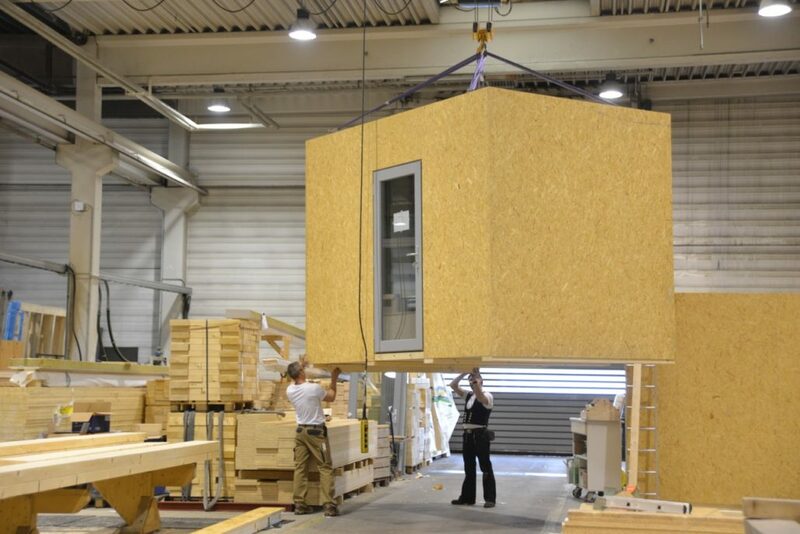 About 500 Solar Decathletes and around 100,000 visitors took part in the 2014 Solar Decathlon Europe. Daily multilingual tours were given by the Darmstadt student team. The organization of the tours took place in two shifts, since the exhibition grounds were open daily from 10 am to 10 pm. In total, at least twenty members of the team were always on site. Additionally, information leaflets in German and English were prepared and distributed to visitors. In order to present a unified appearance, the students created a team t-shirt with the previously designed CUBITY logo. The exhibition concept also included short films about architecture, energy, construction and the LIVING LAB, which were shown in four of the cubes which had been designed as exhibition boxes. The films bundled the thematic focal points in the form of static and dynamic animations, accompanying texts, drawings and interviews. Two of the cubes were fully furnished, in order to give visitors an impression of the living situation. In the central market square, a time lapse documentary movie of the ten day assembly of CUBITY was presented. The presentation of the project goals and contents in films was well received by the exhibition visitors.